NERVE CENTER of invasion traffic on a French beach was this beach party command post. Note handie-talkie and blinker. Somewhere in the western Pacific there's a beach marked off for invasion. Only the high command - the Kings, the Marshalls, the Nimitzes and the MacArthurs - know where it is and when its sands will rock and quake with the pounding shock of battle. But there are a lot of little guys - the bluejackets of the beach - who today can give a most graphic account of what the fight to secure that beachhead will be like. To the men with the scrambled eggs and the five stars, as to everyone else, that invasion means men's lives and hopes, and a step toward victory. But in the division of responsibility and tasks, it becomes a complex pattern. To the high command an invasion is represented by a collection of charts and graphs, of deployment of men and massing of ships, of so many planes and so many tanks. Down through the chain of command the planning becomes more detailed: the battleship gunnery officer figures the coordinates for the first target his 16-inch rifles must smash; the destroyer skipper ponders over charts to determine how close to the enemy he can carry his five-inch guns; the operations officer of an LST flotilla checks his timetable and hopes he can land the tanks in the time allotted. But the beachmasters and the men of the Navy Beach Battalions wonder whether it will be mortars or planes, mines or bombs, gales or punishing surf that will foul up their job of running the toughest link in the chain of assault that extends from the fleet at sea to the doughfoots in the front line foxholes. into a bloody shambles for 24 horrible hours. At Tarawa it was the pointblank guns of pill-boxed Japs which at first made even a landing impossible. At Leyte it was the intense air attack, a torrent of bombs and murderous strafing. At Iwo it was the black shifting volcanic ash and again the horror of mortars. At Okinawa it was the uncharted broad rock reef which stranded the landing craft hundreds of yards offshore. But those landings - and scores more - were made and beachheads established in many instances because Beach Battalions have never accepted temporary set-backs as indices of defeat and because, in the words of one Battalion CO, "It takes just a little training and a lot of guts and imagination to run a beach." Beach Battalions are definitely products of this war. After Dunkirk and Crete and Corregidor, when it was first determined that territory lost to the Axis could be regained only by storming the coasts of Europe and the beaches of the Pacific's myriad islands, concepts of modern warfare underwent drastic changes. Far-seeing planners figured they could put assault troops ashore with the aid of huge fleets of support ships and an umbrella of planes. Landed in sufficient force, the infantry could fight its way inland but to stay there it had to be supplied with food, weapons, ammunition, artillery and tank support. Someone had to control the flow of material across the beaches after they had been won. Shore parties as such are nothing new to the Navy. In naval operations For hundreds of years there often have been emergencies which required the dispatch of groups of men to land, perhaps to put down a small revolt, to help fight fires or to give aid in time of civilian disaster. Men needed for such duty were picked on the spot from members of the ship's company and were called a "shore party," their senior officer a "beachmaster." BEACH SIGNAL FLAG is planted on the shore of Tokashiki Island near Okinawa. This is sign to coxswains offshore to give their landing craft the gun. Today the nomenclature has not changed but the duties are more explicit-and the men are highly trained specialists, superb examples of the Navy's ability to adapt itself to unexpected conditions in a war where adaptability is the key to survival. Early in the present war it was found necessary to use shore parties to carry out special duties, often at the request of the Army and particularly involving work in small boats. To ships' captains the practice was a nuisance; they could not afford to spare the men. Their complaints and recommendations were forwarded to the Navy Department and it was decided that a separate organization, skilled in jobs related to amphibious warfare, should be formed. Action reports from the world's battlefronts were culled for information on which a training program could be based; talks were held with Army officers training troops for amphibious operations. 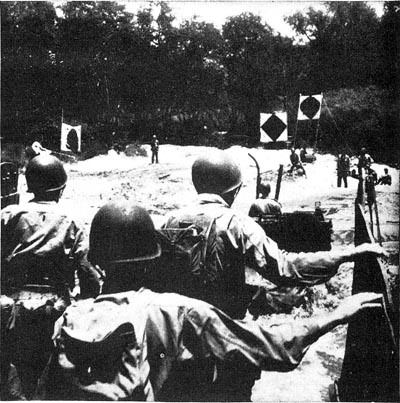 Out of these discussions, reports and experiences of combat vaterans grew a carefully planned scheme of instruction aimed at developing four specilized units, each expert in one phase of beach technique but capable of lending support to the others if need be. 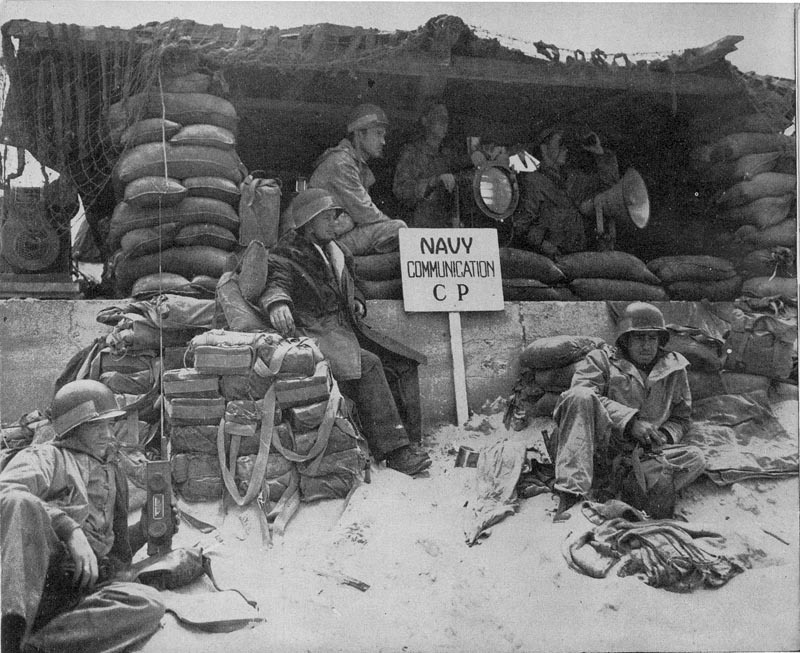 Each man ordered to Beach Battalion duty is immediately assigned to one of these four classifications: Communications, Hydrographic, Boat Repair or Medical, but the Battalion is divided into these four sections only for training purposes. When it goes into action it is broken up into units resembling an army battalion - into companies and platoons. The 450 men in a Battalion are divided into three companies of approximately 138 men each, and each company is split into three platoons of roughly 46 men whose interlocking duties embrace every phase of a Battalion's job. In addition there are eight officers and men in company headquarters and 11 officers and men in battalion headquarters. BEACHMASTER points out unloading area for troops to Army officer. Coordinating incoming naval and land forces is part of the beach party's job. slight but still heavy enough to temporarily delay complete attention to assigned tasks. 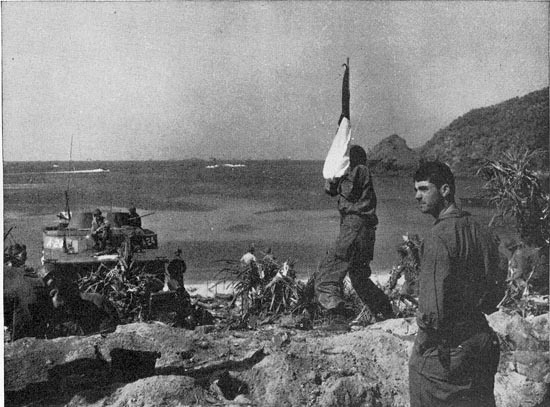 Some minutes after the first assault wave passes onto and over the beach the three waves of Beach Battalion personnel land, scatter their bulky bags of medical equipment, knockdown radio transmitters and signal lamps over the beach so that not all their gear will be destroyed by one bomb or shell. 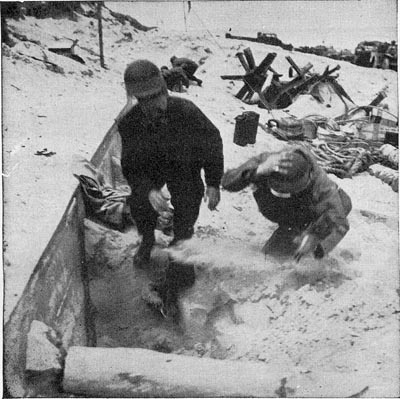 The beach bluejackets burrow quickly into the sand with entrenching tools, each man digging his own foxhole and keeping on the alert for possible enemy counterattacks. The wounded get first attention. Infantrymen cut down in the first waves, Battalion personnel or troops wounded in succeeding waves may be lying on the beach and others may be hit if the enemy can still maintain fire on the area. Each medic carries battle dressing, sulfadiazine pills, sulfanilamide powder and morphine syrettes in a personal back-pack. With these they immediately go into action, checking shock and hemorrhage and relieving pain. Behind a brick wall, a parapet of sand or a thick hedge of trees an emergency casualty station is established by the doctor. It may consist of nothing more than a row of slit trenches big enough to hold a man on a stretcher. If they are needed, all hydrographic and boat repair personnel as well as the medics are pressed into service as stretcher bearers. Each casualty is given pre-operative treatment and identified with a paper tag which, when certain sections are torn off, indicates the nature of the man's wounds, his condition and preliminary treatment. Meanwhile the beachmaster and some of his men trained in hydrographic duties are locating the beach, surveying the approaches, charting underwater obstacles and determining the best passages for the armada of landing craft yet to come. They may have to call on the Navy's underwater demolition teams to blow a path through beach obstacles or the Army's Engineers to rip a hole through jetties or retaining walls. They must have properly cleared channels through which they can bring in craft and send them back out to sea for more loads. Boat repairmen, if released from their stretcher-bearing duties, turn their attention to assault craft only slightly damaged and return them to usefulness, marking others for future removal or demolition. Focal point of all Battalion operations is the beachmaster's command post, located near the high-tide mark and within easy access of beach exits and a cooperating Army CP. Through these CPs urgent messages for air or surface support may often be relayed to the support force from front-line troops. But mostly the beachmaster is concerned with getting men and equipment ashore on the proper beaches at the proper time. Beach communications often have decided the turn of a battle, so the battalions are provided with a wide variety of radio and signaling gear. A two-pound "handie talkie" is used for talk between CPs, as may be a supplemental eight-pound, self-contained flashing light and battery case, also used in case of radio failure. These two, plus a two-piece frequency modulated radio set for ocean-to-shore communications, are most important during the early stages of the assault. Largest piece of equipment is a four-piece radio-on which both voice and code can be transmitted-linking the transports and the beach. Powered by a hand generator it is used for all requests for assistance, information on location of channels through which craft may pass, and beaches on which certain equipment must be landed. Most communications officers think of another piece of signaling equipment as most important. It's an eight-inch shutter-type searchlight with an eight-mile range and powered by a one-cylinder gasoline generator. Radios may be damaged by enemy fire or salt water or rendered useless by enemy jamming. The lamp steps into the gap caused by these failures. Supplementing these devices are the arms and flags of the signalmen who can revert, if necessary, to the old reliable semaphore system. This smoothly coordinated method of operation which takes care of every emergency as it arises did not spring full-blown from some fertile brain. Rather it is the result of long months of trial and error under blood-curdling - and spilling-combat conditions. The development of the First Beach Battalion from an untried outfit to the crack group that stormed the beaches of southern France in the most nearly perfect beach operation of the war aptly illustrates the metamorphosis of beach parties. The men of First Beach suddenly found themselves aboard a large transport one day headed for the invasion of North Africa. Most of them had never been in combat and their equipment was as untested as the men. On 8 Nov. 1942 they somehow navigated the perilously churning surf off Fedala and landed with the assault troops who quickly captured the town. The swiftly flowing and ebbing 11-foot tide and the crashing combers wrecked boats before they could get to them and often swept away valuable equipment. As soon as the town was taken the men took over a small dock inside the breakwater and turned to work as stevedores, unloading Army equipment. 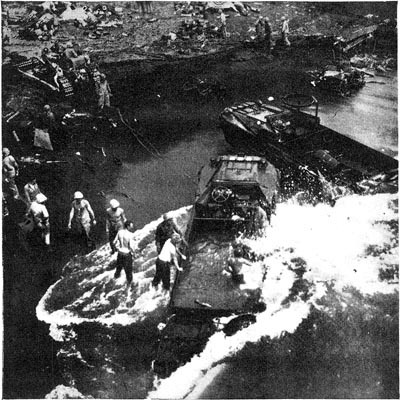 AT IWO, Jap mortars, heavy surf and volcanic sands gave beach party boat-repair men plenty to worry about. 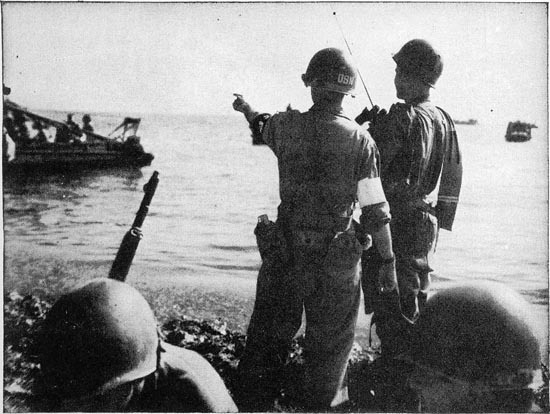 SIGNPOSTS set up on shore by beach party guide landing craft to pre-designated spot to put troops ashore. HIT THE DIRT! Members of beach party dive for foxhole in sands of Normandy as Nazi plane strafes the beach. 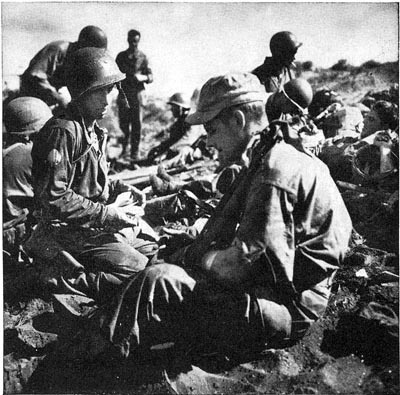 FIRST AID is given soldiers by beach party men at Lingayen Gulf in the invasion of Luzon. It was a rugged show. and quickly developed into a seasoned crew. Before shoving off for their next assignment they were commissioned as an official unit, complete with CO, HQ group, etc. Surf again hampered their operations when they landed near Scoglitti in Sicily. Although their equipment had been improved they still lacked enough to remove broached and damaged craft and salvage work became almost impossible. After more training, this time in Africa, and scrounging more equipment, the First set forth for its toughest assignment to date-the rugged battle of Salerno. Tough as it was the men still refer to it as a "smooth job." Somewhere along the line they had accumulated rolling stock-bulldozers, DUKWs and jeeps. Although they were chased off the beach three times on the first day by rampaging Jerry, tanks and gunfire and although a checkerboard pattern of mines on the beach made every step one of potential death, they worked as a Beach Battalion should. As vicious as was Salerno, Anzio was worse. For 77 days they lived in foxholes under constant bombing and with the dreaded 88s pouring pointblank fire on their positions; for 77 days they battled the weather which permitted landing operations only 50%0 of the time; for 77 days they struggled to supply the Army, which was so valiantly trying to break out of the beachhead and link up with the 5th. The Italian campaign gave the First the experience and battle-conditioning it needed. When the time came for the final amphibious operation that was to spell the doom of the European Axis, they were ready for anything. The southern France operation was as smooth as any landing possibly could be. Principal resistance came from underwater mine-tipped tetrahedrons in the shallows but the First suffered few casualties and, on the first day, converted the beach into a model of efficiency. The miracles performed by the battalions of the European-African theater have been duplicated, although on a somewhat smaller scale, in the Pacific island warfare. Their transition from haphazard outfits to superbly functional links in the amphibious capture of island bases has been achieved in much the same manner, by trial and error and by experience that can be gained only in battle. Up to the Leyte campaign the original Pacific landings were on a much smaller scale-usually in divisional strength-than the Atlantic or Med assaults. For that reason the beach bluejackets worked with a much looser organization, not as a battalion but as a platoon, each one attached to an APA and headed by an officer known as the platoon beachmaster. Over-all command of the beach units was delegated to the "Transdiv beachmaster" assigned to each transport division. Pacific beach parties employed only the equipment they could pack on their backs: they had no DUKWs, no trucks or bulldozers or jeeps but they did have their own small boats for hydrographic work. In the assault phase the platoon beachmaster generally landed in the third wave, taking with him his communications group and a few medics. More medics landed in the fourth wave but hydrographic and boat repair men remained offshore near the traffic control vessel until ordered in by the beachmaster. Unlike the battalions operating in Europe where they remained on shore until a favorable port was captured and able to receive supplies, the Pacific platoons stuck to their beaches only as long as their transports remained off the beachhead. Because they were permanently attached to the APAs they had to move along when the ships did. To compensate for this method the Navy organized garrison battalions which moved in when the assault platoons departed and handled the buildup of supply, later becoming a part of the permanent island garrison. As the records show, the single-platoon plan worked efficiently, even in such operations as Iwo where all beach units were driven off the northern sands, and Tarawa where, on one beach, the landing , was delayed a whole day by enemy opposition. But when it came time for the big operations - Leyte, Lingayen, Okinawa - where more men were to land than in any other Pacific invasion, the Navy decided to employ the tried and proved methods of the Mediterranean. Lingayen Gulf was a rugged show. Jap mortar fire drove the sailors off one beach. Another was long and sloping and impractical for landing. Storms ripped at most of the beaches and added to the natural hazards and those conceived by the Japs. Okinawa was a dream in most respects because the enemy just didn't seem to give a damn whether a squad of marines or a million-man army debarked. On one beach a wide rock reef held up unloading at low tide and landing craft were unable to cross it and reach the sand some distance away. The beach cops' ingenuity finally solved the problem: they landed the tanks and trucks on the reef, drove them across and ferried them the rest of the way in smaller craft. The marines and GIs will tell you it worked well: most spur-of-the-moment beach party ideas do. The Beach Battalions have their biggest job ahead of them. It may be Kyushu or Honshu or Formosa or the China coast but the men, the guns, the tanks and ammo will get ashore and stay there because of their know-how, can-do and have-done.